On this day Jack Reilly had a little to say, "Went ashore today & had a good walk around island. It is very pretty country. The hills are very green & covered with pretty wild flowers. Everywhere are green fields of wheat and growing thickly between the stalks are beautiful red poppies. We marched through the village of Madros. The houses are built of stone with tiled roof are very close together but look clean & picturesque & remind me of picture I have seen of a Swiss village. There are soldiers everywhere, English, French & Australians. The Harbour is a fine sight from the hills being almost crammed with troopships, man of wars, submarines, etc. we return to the ship about 3pm. Our chaps captured a Turk spy yesterday & brought him aboard." The Battalion War Diary states simply, "Took the battalion ashore to bathe and route march." During this period planning was continuing. The chance of a surprise attack had been seriously compromised by the total lack of secrecy or discretion in the early stages of the Dardanelles campaign. Numerous attempts had been made to breach Turkish defences through Naval attacks and small landings. Supplies and equipment were being purchased from nearby ports and troops had been in Lemnos for many weeks. Enemy spy's would have made light work of reporting the build-up. Birdwood was not quite so sanguine as Hamilton and Braithwaite in regards to the Australian force reaching and storming Mal Tepe. 'I might find this difficult,' he wrote, 'as Mal Tepe is likely to be commanded by guns from all directions, and I shall really not know in which direction to expect attack.' He decided that his first task was clear. It was to seize the mass of the mountain comprising 971 and its seaward spurs. 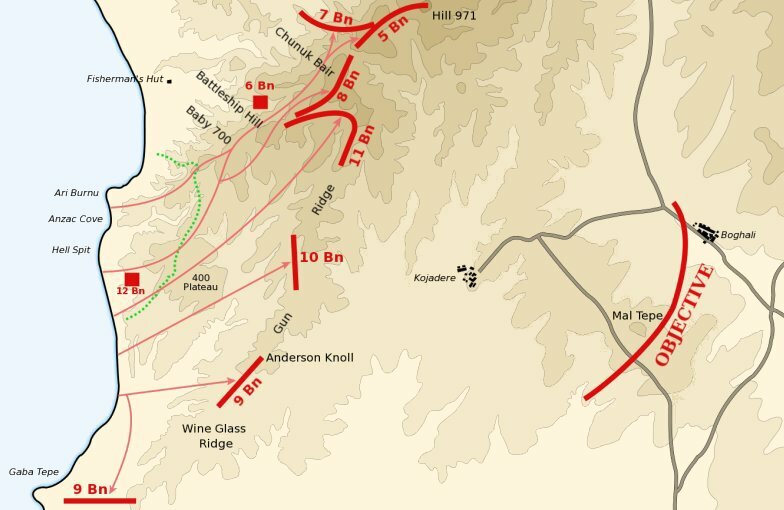 Hamilton's plans had suggested that he should in the first instance occupy at least the central portion of the main ridge about Chunuk Bair and what was later known at Battleship Hill, and their spurs running to the sea on on either flank. This arrowhead of ridges would form a strong covering position, and Hamilton left it to Birdwood's discretion whether to extend it by seizing the actual summit of 971 or not."